DENPASAR - Minister of Energy and Mineral Resources Ignasius Jonan witnessed the signing of a Memorandum of Understanding (MoU) between the Governor of Bali with BPSDM ESDM, PT Pertamina, PT PLN JTBN, and PT Indonesia Power at the Widya Sabha Auditorium at Udayana University, Bali, on Friday (5/10 ) The Memorandum of Understanding contains the Government of Bali's commitment to developing and utilizing clean energy-based technology to realize a clean, green and beautiful Bali program. Jonan explained, the use of renewable energy (EBT) in Bali is very suitable and good for the environment. As a tourism area, Bali should develop environmentally friendly energy so that tourists are comfortable with clean air. "There is no tourism area in the world that does not use renewable energy. Because must maintain air quality," explained Jonan when he was a speaker at Udayana University (UNUD) with the theme "Energy Fairness," shortly after the signing of the Memorandum of Understanding. Jonan also explained, the use of solar and wind energy is also very cheap. He hopes Bali Province can use solar and wind energy for regional development in Bali. In addition, he hopes that there will be other innovations from the community that support the development of Renewable Energy (EBT). 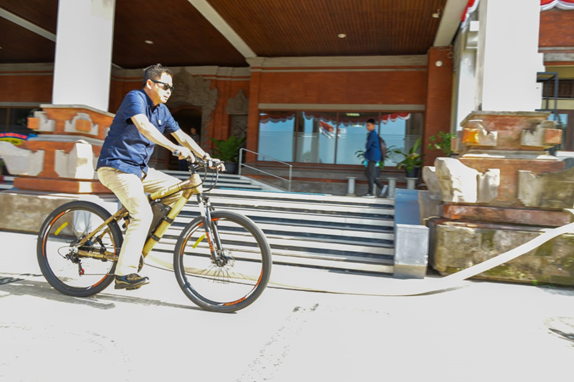 With dark glasses wearing casual clothes, Minister Jonan put his foot on the bicycle pedal, without pedaling it, going around the courtyard of the Udayana University rectorate building, after giving a public lecture to the academics in the Widya Sabha Auditorium Building. Jonan was accompanied by the Governor of Bali Wayan Koster and the Chancellor of Unud Prof. Dr. Dr. A.A Raka Sudewi was amazed by the idea of ​​making an electric bicycle facilitated by PT. Pertamina (Persero). "This idea (making electric bikes) is cool. It must begin to think about mass production to make it more economical," Jonan told to the initiator. Furthermore, Jonan revealed that the presence of electric bikes is a proof of community initiation in creating clean energy in Bali Province. Moreover, Bali is one of the pilot provinces for the use of Renewable Energy (EBT) in Indonesia.